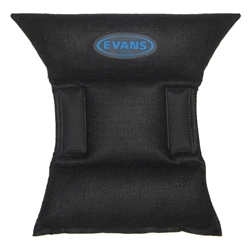 Evans EQ pad is a highly efficient bass drum muffler that attaches to the bottom of the bass drum shell with Velcro. The hinged pad bounces off the head, allowing sustain, before returning to damp the vibrating head. A smaller pad on the opposite end can be used on smaller drums or for minimal damping.